The provisional standings for the 2018-19 CTG winter league are now available. Please have a look at them to make sure that they are correct, and email helen.martin@trecgroup.co.uk if you think there is an error. Please note that these are provisional standings and if errors are found then the placings may change, either up or down. The league awards will be presented at Park Farm on Sunday 28th April, together with the competition prizes, so we hope to see lots of CTG members and supporters there to congratulate the winners. Level 1A for ‘Improvers’. This will be a good opportunity to try the challenges that are usually seen at the higher levels, like bearings, a grid reference section and/or navigating on an aerial photo, without the challenge of 30km of route. We will endeavour to pair up novices with more experienced riders at this level if requested, please send a message to our Facebook page if you would like matchmaking. 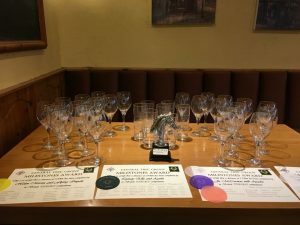 We are also planning to present our CTG Winter League prizes at the prizegiving on the Sunday afternoon, so do check the League standings and see if you are in line for one of our fabulous engraved glasses. We hope that lots of people will attend, either to ride, help or spectate, and that the weather is reminiscent of last year’s competition (where quite a few people went home sunburned…). Click on our Calendar page for the schedule and the online entry form link. Central TREC Group apologises to all our members and competitors, but despite looking at all available dates we have been unable to find a new date for the Low Farm arena TREC competition that was due to be held on 10th February 2019. We took the decision to postpone due to the risk of spreading Equine Influenza inherent in running an event, which despite being very low was nonetheless present. We have looked at all the weekends between now and the extended end of the TREC GB winter season but couldn’t find a date that Low Farm was available without creating a clash with another event being run by either ourselves or Keysoe and Three Shires TREC. We have therefore reluctantly taken the decision to cancel the event altogether. Those people who had entered Low Farm have already been contacted to ask whether they would like refunds or to carry their entry fees over to another Central TREC Group event. If any riders have not responded, or wish to change their mind and request a refund, please email helen.martin@trecgroup.co.uk. Please send your name and details of how your refund can be made, either (preferably) PayPal or your sort code and bank account number for a BACS refund. Our upcoming events are all listed in full on our Calendar page, but briefly comprise our last arena TREC competition of the winter season on 24th March, mounted POR training on 14th April, mounted PTV training on 22nd April and a season-opening full summer competition at Park Farm on 28th April, so there are lots of events to roll your money over to! Once again, our apologies for this cancellation and we hope to see you at another Central TREC Group event soon. We are running a joint training session with Keysoe & Three Shires TREC Group on 17 February at Shuttleworth College. This training is suitable for anyone wanting to learn how to judge obstacles and become a trainee judge. For further information and to book a place, please click here. The results are in, the placings have been counted and verified and the final standings for the Central TREC Group Summer League 2018 are now available! To summarise the way the standings are worked out, all results gained in TREC GB affiliated TREC competitions run in the summer 2018 season by CTG members count towards this league. Placings from pairs and individual classes at the relevant level(s) are all awarded points (1st = 10 points, 2nd = 9 points, 3rd = 8 points, etc). The best 3 results gained at each level are counted, and ties are split using the MA+PTV score gained by that rider at each competition for which the placing is counted. Engraved wine glasses are awarded to the top 6 members in each league, and they will be presented at our AGM and Awards Presentation on 25th November at the Blue Lias Inn, Stockton Road, Southam. We hope to see lots of winners there! The results are now available for our split competition at Alconbury and Tur Langton. Please visit the Results page for more information. The 2018-19 winter season is about to get underway, with our first Arena TREC competition at Long Drove Equestrian Centre. We hope that you will join in the fun at some of our events, and don’t forget that all CTG members who compete in the same class at more than one CTG event will be entered into the 2018-19 Winter League. We have also organised the date and venue for our Annual General Meeting – Sunday 25th November at the Blue Lias Inn, Long Itchington. We will have Sunday lunch, there will be a paper-based training exercise available for those who would like to exercise the grey matter a little, the AGM of the charity and then we will award the prizes for the 2018 CTG Summer League. Full details of the day can be found on the Calendar page, and the provisional standings for the summer league will be posted here once they are available. The results for the Alconbury event (also comprising the MA and PTV phases of the Alconbury and Tur Langton split competition) are now available on the Results page. Well done to everyone who rode, and many thanks to all those who judged and helped (particularly Sarah Wynn who organised the event and Claire Pollard who TD’d). The second half of the competition will be the POR at Tur Langton on 30th September, and there are still places available for that event. The schedule is on the Calendar page of the website and we look forward to seeing lots of people there! Long Drove applied dressage training – back by popular demand! Following on from the success of the 2 applied dressage training events that we have run with Tara Osborn so far this year (in January and April) we have booked another date at Long Drove near Huntingdon – Saturday 22nd September 2018. If you want to polish your MA and PTV skills in time for the winter season or fancy trying your hand (or hoof!) at TREC for the first time then come along and join the fun. We may be able to run an in hand session if there is demand for this, just mark it on your entry form. We are also offering judges’ training alongside the mounted training, if you are interested please email central@trecgroup.co.uk. Judges who were trained in the first year of TREC GB (2015) need to refresh their qualification by the end of October 2018 if they don’t want to have to go through the provisional sign-off process again. Full details of the mounted training and the entry form can be found on our Calendar page.